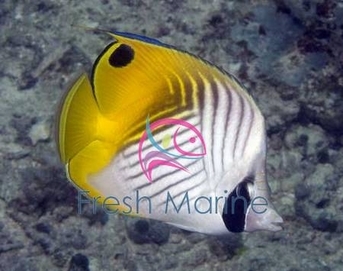 https://sep.yimg.com/ay/yhst-33477391359232/auriga-butterfly-fish-chaetodon-auriga-threadfin-butterflyfish-6.jpgAuriga Butterfly Fish - Chaetodon auriga - Threadfin Butterflyfish EasyPeaceful75 Gallon9.0 inchesNoOmnivore, BrineRed Sea; Indo-Pacific region to HawaiiChaetodontidaeSmall 1" - 2"
The Auriga Butterflyfish, also known as the Threadfin Butterflyfish, is one of the more popular and readily available butterflyfish. A great beauty and hardy aquarium specimen. In the wild it is found on inner and outer reef slopes. As with many fish, the Threadfin Butterfly's color and markings can vary with the region of origin. Red Sea specimens tend to lose the eyespot (false eye to confuse predators) on the dorsal fin. The Auriga Butterflyfish is quite shy and should be provided multiple hiding places. It is safe to keep it in a live rock-only tank, although it will pick at the rock. With age, grows a trailing filament from the posterior dorsal fin. To eight inches long. Feeds principally on sessile invertebraes, including cnidarians and algae. Threadfin Butterflyfish; so named for a trailing filament that grows from the posterior dorsal fin. Some folks use this hardy species to rid their systems of pest anemones of the genus Aiptasia, and is known to consume most Large Polyp Stony coral polyps, Feather Dusters and Fanworms as food. It will accept a wide range of aquarium fare and can withstand some neglect, for a butterfly. Of course, optimal water quality is required to ensure its good health. Once acclimated, it tends to be one of the more bold butterflies. It can be employed to clean live rock of aiptasiaanemones . Maximum Size: The Auriga Butterfly grows up to 9 inches. Minimum Tank Size: The Auriga Butterfly prefers a tank of at least 80 gallons with plenty of places to hide & swim. Behavior: The Auriga Butterfly may act semi-aggressively toward other fish. Habitat: Maldives, Fiji, Tonga, Hawaii, Indian Ocean. Feeding and Diet: The Auriga Butterflyfish diet primarily consists of coral polyps, crustaceans, and algae in the wild. In an aquarium, frozen and freeze-dried diets containing algae are good substitutes and can be supplemented with asparagus, broccoli, and some dried algae.